I had decided awhile ago that I was going to do 15mm Vietnam, even before Shawn Carpenter told me that we’d be redoing Ambush Valley. I was intrigued by the Flashpoint releases, promising a full range of figures including civilians, free world forces and special forces. 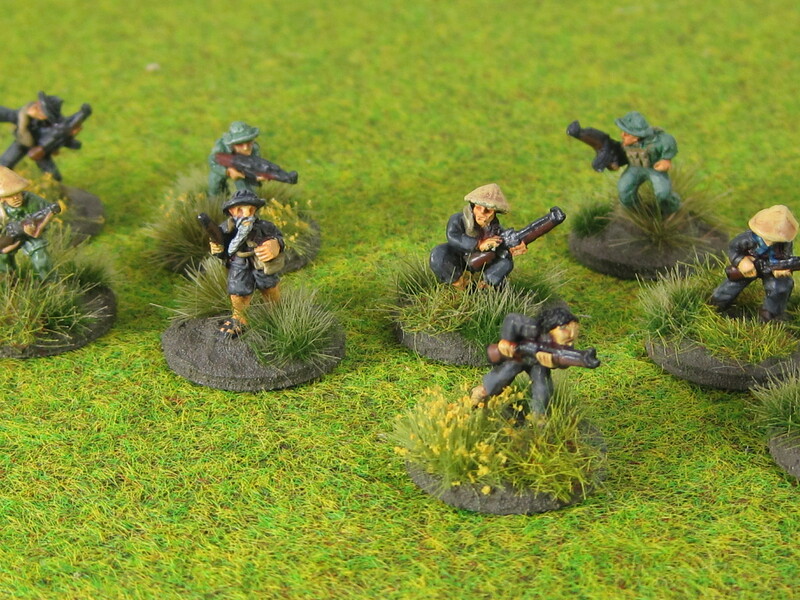 Then Battlefront released their own 15mm models based around the Ia Drang Valley in 1965, offering more options and vehicles. I purchased a lot of figures from both lines and they sat on my workbench for months. With the release of the new Ambush Valley, I’ve been inspired to pick up the paint brush and get to work, if for no other reason than to pay homage to the excellent work done by Piers and Joe in putting the book together. My first project is getting Viet Cong painted. I want to run games involving smaller forces on “sweep and clear” type missions, so my NVA will have to wait for awhile. 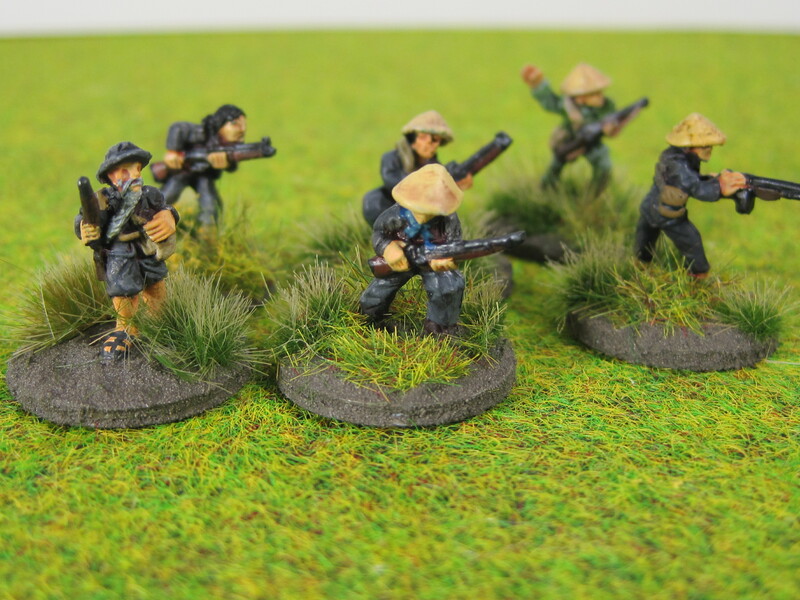 Since Battlefront has yet to release VC figures, my only option was Flashpoint, but the company offers Local and Main Force Viet Cong, as well as support weapons and civilians. The models are on .75 inch bases (penny-sized) which I built up with Vallejo Dark Earth paste. 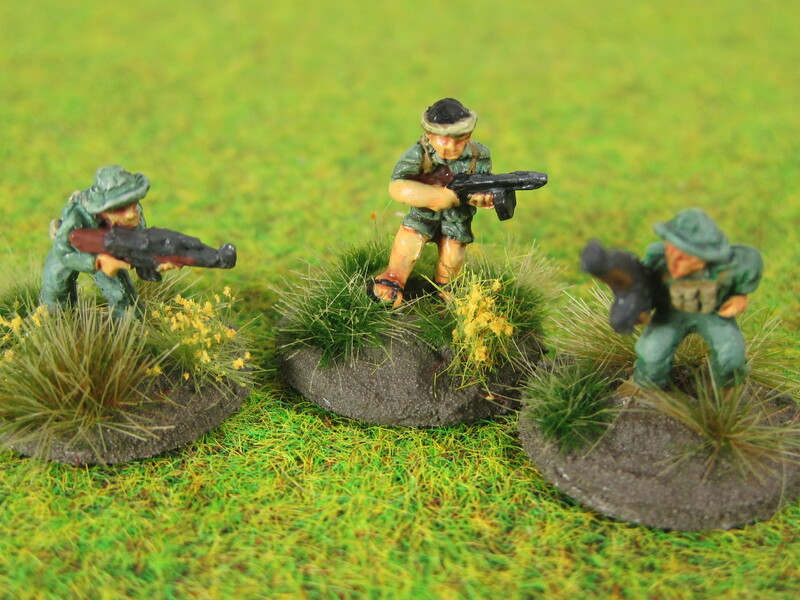 The grass and flower tufts are from three different sets of Army Painter base tufts, including the new flower set. I wanted the VC to look like they were in the middle of cover, not standing on a golf course. For uniforms, I wanted a mix of the classic “black pajama” look with some mix of Main Force uniforms. The black uniforms are a thinned down Vallejo German Gray, highlighted with the same color mixed with Vallejo Ivory. The straw hats are Vallejo Beige, then washed with Vallejo Sepia Wash. Flesh is Vallejo Sunny Skintone washed with Flesh Wash. The Flashpoint figures have deep detail which lends itself to washes and stains. 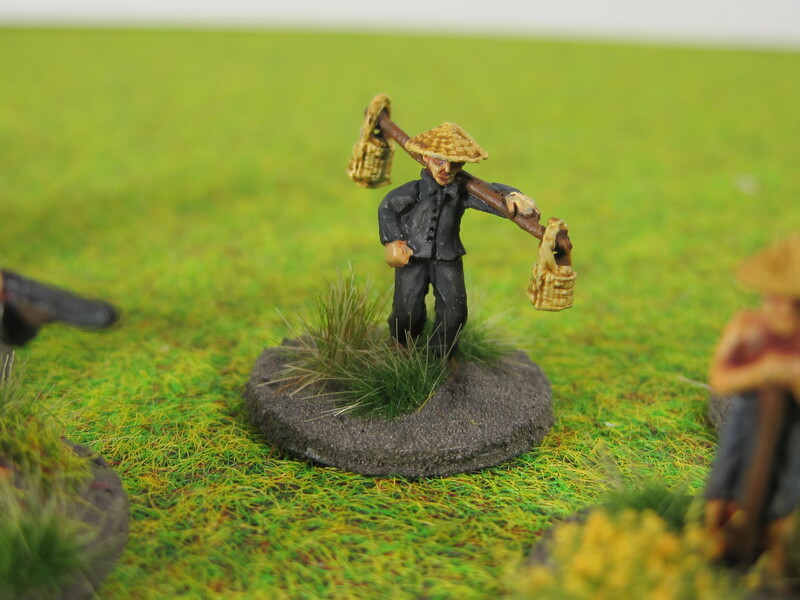 I also tacked a few civilian figures to mix into my village and rice paddy settings. A close up of a Vietnamese civilian. I’m quite pleased with how these are turning out. The figures have “personality,” allow for quick painting and fit the look I am trying to achieve. My only real complaint about the models is the percentage that have miscasts, forcing quite a bit of file and knife work to fix. Still, I recommend Flashpoint’s models, especially their civilians. Next time, I’ll show what I’m doing with some of the village buildings. No, I cannot get that small 🙂 Thanks for the kind words.